In the wake of Twitter’s IPO, the word frothy is getting tossed around a lot. It’s what you say when you don’t want to be alarmist about another dotcom bubble, but you still see a classic sign of a market gone loopy: a disconnect between what a company is actually doing and what investors, in valuing the company in the open market, think the company is doing. Put simply, the efficient market hypothesis says that markets fairly value stocks based on all available information. That idea has taken a beating in the past 10 or 15 years, but it endures. And yet we keep entering periods when emotion breaks away from the rational study of information on a stock. So much so that how we see a stock and how we see a company often become two separate things. This is evident among many growing startups. Twitter’s $25 billion valuation is based less on the company today than on a company investors expect to exist in three or four years. The high valuations of Pinterest, Uber and others rely on the same hope. What’s less acknowledged these days is that such a disconnect between reason and rationality — between the stock and the company — is happening with old, big tech giants too. And nowhere more so than with Apple. Apple the company is doing about as well as it ever has. CEO Tim Cook recently told employees that the firm “has never been stronger.” It’s one of those things CEOs are supposed to say to the rank and file, but it’s not far from the actual truth. Heading into the holiday season, Apple is releasing the high-end iPhone 5s, the lower-cost but brighter 5c, the iPad Air and iPad Mini with Retina display. All are devices at the forefront of their markets. Apple the stock isn’t doing quite as well. Over the past year, it’s fallen 11%, even while the Nasdaq Composite Index has risen 29%. And it’s down 26% from its record high of $705 in September 2012. It’s trading at 12.9 times its recent annual earnings and 11.7 times its estimated earnings this year. The S&P 500’s average historical PE ratio is 19.4. 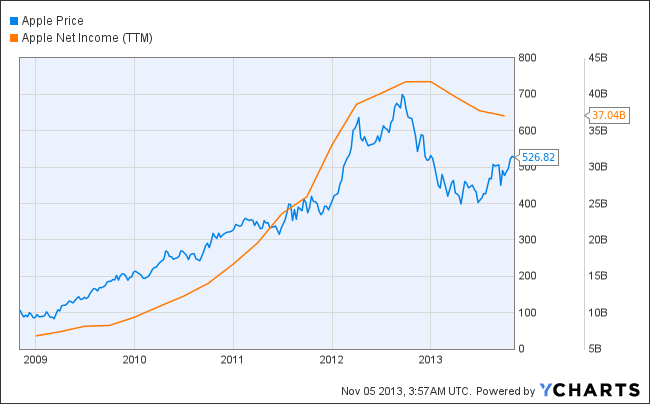 Apple is such a well-known company that its stock performance reflects on its consumer brand. And so disappointment in its income statement ends up bleeding into the company’s public image. Apple’s net income has been declining this year because the company hasn’t had a full quarter in a while when it had recently refreshed its mobile devices, and because gross margins have been pressured as Apple tries to compete against lower-priced Android devices. It’s gotten bad enough that Apple is dragging down the tech sector’s overall earnings growth: tech stocks in the S&P 500 would have seen earnings grow at an 11.3% pace this year without Apple included, according to FactSet. With Apple, they grew only 7.2%. 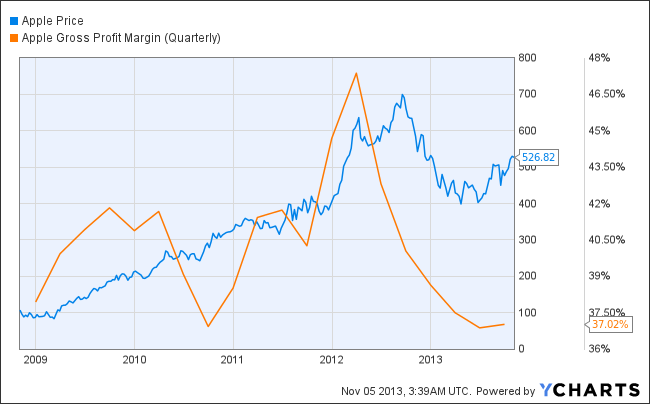 Gross margins are an especially thorny issue with investors. Gross profits have eroded to 37% of revenue (or 38.5%, excluding a recent change in revenue accounting) from a peak of 47% in early 2012 as Apple has competed more on price in its iPhones, iPads and Macs. Companies in competitive industries often trade higher margins for lower prices if it means maintaining or expanding market share. That strategy has worked well for Amazon. It’s working less well for Apple. This may be troubling news for investors seeking returns from capital gains, although Apple has been trying to compensate through higher dividends and a $60 billion buyback program. It’s not necessarily bad news for Apple itself. It means Apple isn’t holding to the idea that profits must constantly be growing aggressively, every single quarter. The company is focused instead on strategies that will keep it strong in older markets and position itself for new ones. Apple bulls see positive signs ahead. iPhone sales increased 26% in September after 5s and 5c models went on sale. iPad Airs went on sale this month, and in an encouraging sign of brand loyalty, many buyers are replacing older iPads. One analyst, Charlie Wolf at Needham, argued that Apple’s strategy to position its devices as “the aspirational brand” in developed and emerging economies will keep growth steady in these products without waging price wars. Then there’s Apple’s ability to create or remake new technology categories. Cook’s oft-repeated promises on this front have grown so insistent, he’s either desperate or cooking up something big. Signs point to the latter, be it a wearable Apple device or an iTV. Apple has quietly made 15 strategic acquisitions this year, many unannounced, and is boosting its capital spending to $11 billion this fiscal year from $7 billion last year. Other analysts remain bearish. “To us, Apple no longer deserves a rich multiple for the simple reason that its sales growth is pedestrian, its net income is falling and its reliance on two sensationally popular products — the iPhone and the iPad — is exceedingly high,” Per Lindberg of ABG Sundal Collier wrote in a recent report. Such sentiments explain Apple’s lackluster stock performance this year. But they seem out of touch with Apple the company, which in some respects is still at the top of its game. A company’s operational health and its stock performance can diverge for a long while, but they inevitably come back into sync. The debate will rage over which Apple will prevail, but right now it looks like this is a well-run company trading cheaply.